In 1995, the Victorian Preservation Association (VPA) learned that the home of Andrew P. Hill, an early and important San Jose photographer and painter, was under threat of being demolished. This San Jose City Historic Landmark building was formerly located at 1350 Sherman St. As part of its preservation mission, the VPA bought the house for $1, and it was moved to the San Jose History Park where the VPA has restored it. Who was Andrew P. Hill? Andrew P. Hill was born in Porter County, Indiana on August 9, 1853 and came west with his uncle in 1867. After attending school and working for a time as a draftsman, he opened a portrait studio in San Jose. From there he honed his painting skills, and eventually expanded his artistic efforts into photography as well. While photographing the redwoods near Felton, he discovered that nearby groves of old-growth redwoods were soon to be logged. In order to save these trees, he founded the Sempervirens Club, a group of environmentalists interested in protecting the coastal redwoods. Martialling many prominent local persons to the cause, he convinced the California legislature to purchase the area now known as Big Basin and to preserve it as California’s first state park. A more detailed biographical sketch of Andrew P. Hill has been provided by the late Leonard MacKay, AP Hill scholar. 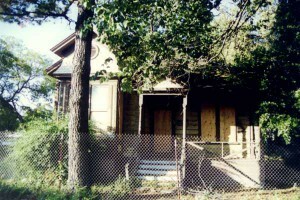 The Hill House was built in 1889. Andrew Hill bought the house in 1898 and lived here until this death in 1922. The house is a good example of the Queen Anne style of Victorian home. While the Queen Anne style knows no limits of elaborateness with turrets, dormers, multiple porches, etc., the one-storey Hill House is a rather simple example of the style. The front of the house consists of a front porch and a bay window to the front parlor. Above both are dormers with patterned shingles. The front porch has turned columns and newel posts recreated from an existing picture of the house. The house is painted in a four-color scheme which would have been typical to the time. When acquired by the VPA, the house had come upon hard times. It had been a rental property, and seemed to have been squatted in for the last few years. Several dumpsters of trash were removed from the house before moving day. Once in place at the museum, and secure on a new foundation, restoration began. Unfortunately, the interior of the house was in such bad shape that it was gutted down to the studs and rebuilt. While the fir floor is original, much of the rest had to be recreated. For example, the interior molding was in such poor shape that it had to be replicated throughout. The restoration was completed in 2010. The Hill House is a three bedroom, one bath house, with a central hallway. Entering the house from the front porch, the hallway provides access to the front parlor, back parlor, and kitchen on the left side. On the right side of the house, you’ll find three bedrooms and the bathroom. The front parlor is what we would now refer to as the “living room”. As Victorians were much more formal than we are today, their houses were set up so that guests could be greeted and entertained in the formal parlor. Unless they were a close friend of the family, guests seldom saw any other part of the house. 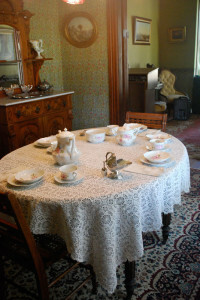 Since this room is the most formal room of the house, it is decorated and furnished to represent the lifestyle that Andrew Hill might have enjoyed at the turn of the century. The walls and ceiling are decorated with reproduction Victorian wallpaper from Bradbury & Bradbury in Benicia. The house is furnished in a manner typical to an upper middle-class home in the 1890s. We are also fortunate to be able to display several Andrew Hill paintings from the History San Jose collection in the house. Would Andrew P. Hill’s house be so elaborately decorated? On one hand, he was an artist, and never financially well-off. On the other hand, he was an artist, and would appreciate the beauty and design of the latest styles. Unfortunately, no photos of the interior of the house during Hill’s occupancy have been found. Connected to the front parlor by a set of pocket doors is the back parlor. This room might have been the “family room”, and much less formal than the front parlor. However the house would then have lacked a dining room, so the back parlor is decorated as the dining room. 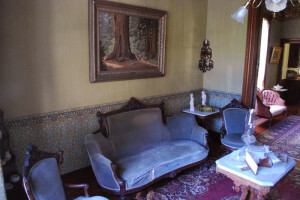 This room is meticulously furnished and decorated to the period of the house. Victorian kitchens were a far cry from kitchens built a hundred years later. Since kitchens are usually the most often renovated room in an old house, it is unusual to find an old house with an intact original kitchen. The Hill House is no exception. 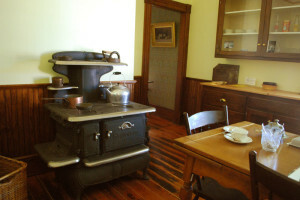 The kitchen has been restored to look like a kitchen of the period including a typical coal-burning kitchen stove from the time the house was built. A small pantry off the main kitchen room has also been restored. This bedroom has been furnished to an example of what a middle to upper class boudoir would have looked like. 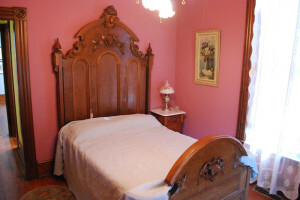 It features a rare walnut Eastlake styled bedroom suite. This bedroom houses exhibits on Andrew Hill, as well as rotating exhibits that showcase the private collections of VPA members. Visitors can also read about Hill’s life and his founding of the Sempervirens Club which . As with kitchens, in the 1890s bathrooms were just being introduced into homes. No longer did you have to make a trip out to the outhouse in the backyard. The VPA has restored the bathroom with period fixtures such as a claw foot tub, high-tank water closet, and wall sink. This room is set up as Andrew Hill’s studio. 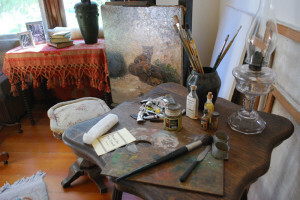 While it is known that Hill had a studio in his home after his studio in downtown San Jose was destroyed in the 1906 earthquake, we do not know which room served as the studio. There was also a dark room in a small outbuilding that unfortunately could not be salvaged. We also know he worked out of this house, as his letterhead with the original house address is in the History San Jose collection. The Hill House originally did not have a full basement, although many homes from that period did. The VPA incorporated a full basement under the house when it was moved to History Park to provide room for storage. The basement is not open to the public. You can take a virtual tour of the Hill House courtesy of History San Jose and the Google Cultural Institute. We hope that you will come by to see the Hill House on your next visit to San Jose History Park. The park features a fully restored Victorian town square with surrounding buildings and offers a myriad of things to do and see. Visitors are invited to take self-guided tours of the grounds & gardens. Each day, several of the buildings are open with docents to discuss the Valley’s rich history. There are three exhibit galleries to explore. You can hop on a Vintage trolley for a free ride around the park. See the Trolley barn’s exhibit of antique Trolleys, cars, and machinery. Visit a working printing shop. Indulge in the savories and sweets at O’Brien’s Café. History Park hosts many special events, visit their website to get the whole story. Donations for the Andrew P. Hill house are greatly appreciated. If you have items relating to Andrew P. Hill, please contact us at the address below. Of course monetary donations for the operation and upkeep of the house are just as welcome as well as any donation of your time to help maintain and share this important piece of San Jose history with the public. All material donations are tax deductible. The Hill House project has been funded through generous grants from the Historical Heritage Commission of Santa Clara County and the Victorian Preservation Association. Jul. 11, 1995 Our first look at the house. We decide to proceed anyways. 1996 Clean out day. Removed several truckloads of rubbish. Jan.17, 1997 The house gets lifted off the foundation. Feb. 3, 1997 The house is moved off the foundation and set on cribs. Feb. 5, 1997 The house gets a new set of wheels. Feb. 9, 1997 Moving Day! Aug. 2002 The Hill House gets new porch and step railings. Mar. 2003 Painting of the exterior begins! Feb. 2007 The restoration is nearly complete! May 2007 House is handed over to the Decorating and Exhibit teams to be transformed into San Jose History Park’s newest house museum! Nov. 2008 The decor and exhibit teams are nearly done. The construction is done, now all we need is the Occupancy Permit signed off by the city. Apr. 2009 Hill House Opening for VPA members. Jul. 25, 2010 Hill House Grand Opening. The restoration of the Hill House was funded through generous grants from the Historical Heritage Commission of Santa Clara County and the Victorian Preservation Association. We are indebted to them. If you would like more information about Andrew P. Hill, we recommend the book “Grand and Ancient Forest – the story of Andrew P. Hill and Big Basin State Park” by Carolyn de Vries. Donations for the Andrew P. Hill house would be greatly appreciated. If you have items relating to Andrew P. Hill, please contact us. Of course monetary donations are always welcome as would donation of your time to help this important piece of San Jose history continue to thrive. All donations are tax deductible. Volunteers are needed to docent at the Hill House. If you are interested, please contact Lorraine Glick or email us at info@vpa.org.